The Airbus Helicopters AS350 B3 is a single-engined utility helicopter that can accommodate up to 7 passengers. Development of the AS 350 Ecureuil started in the early 70s under the Aérospatiale banner. The first flight of an AvcoLycoming LTS101-powered machine took place on 27 June 1994. The second prototype was fitted with an Arriel 1A and took to the air on 14 February 1975. Certification (with a Turboméca Arriel 1B turboshaft powerplant) was achieved on 27 October 1977. The single-engined AS 350B2, powered with a Turbomeca Arriel 1D1 engine was certified in April 1989. The helicopter divisions of MBB from Germany and Aerospatiale from France merged in January 1992 to form the Eurocopter Group. The Eurocopter AS350 B3 is a high-performance version of the AS350 series, powered by a Arriel 2B engine equipped with a single channel (DECU) Digital Engine Control Unit with a mechanical backup system. The AS350 B3, made its first flight from Marignane on 4 March 1997. Latest upgrade of the AS350 is the AS350 B3e (enhanced) version that is fitted with a Turboméca Arriel 2D engine. The AS350 B3e model was approved by the EASA on 17 June 2011 and has next to the new engine, a new interior design, tail rotor improvements and optimised optional equipment. The new console panel’s concept “Multibloc” is installed since aircraft S/N 7218. The AS350 B3e has an upgraded MTOW of 2370 kg when dual hydraulic. Over 5200 AS350 models had been delivered worldwide. The AS 350 is marketed as Ecureuil. The AS350 Ecurieul is also known Squirrel and is marketed as Esquilo in Brazil and AStar in the USA. In the USA, the AS350 is also known as SuperStar. The ICAO Aircraft Type Designator for the AS350 helicopters is AS50. On 4 July 2007, permit to fly with the Eurocopter France test registration F-WWPG was issued for the Eurocopter AS350 B3 Ecureuil c/n 4267. On 17 July 2007, the helicopter was registered SE-HJB in Sweden with Scandinavian Helicopter Group AB, Göteborg. On 19 July 2007, registration SE-HJB was cancelled as exported to the USA and the next day the 2007-built helicopter was registered as N350AY in the USA. On 4 May 2012, registration N350AY was cancelled as exported to Germany. On 9 May 2012, the AS350 B3 Ecureuil was permitted to fly with registration D-HBLA and on 21 September 2012, the helicopter was registered D-HBLA with A. Borodachev (Alex Metall GmbH) as owner and AVEO Air Service Ltd. & Co. KG, Essen/Mülheim Airport, as operator. 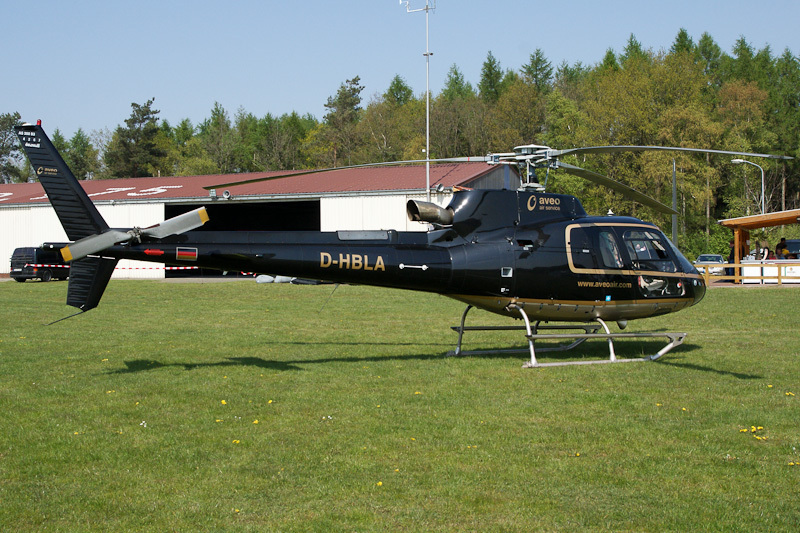 Ecureuil D-HBLA was seen at MLA airfield Dankern near Haren (Ems) in Germany when used for helicopter parachute jumping on 19 and 20 April 2014. To jump, the parachutistst were taken by helicopter to an altitude of 3000 meters. According to the figures at flightradar24, the helicopter took the parachutists even to an altitude of 15,287 ft (4659 meters) for a jump of one of the skydivers, that was made about 30 minutes after this photo of the helicopter was taken.